Some Windows versions of the game didn't receive updates. See the patches section. 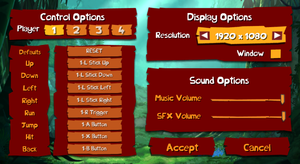 Main menus shows version number 1.0.32504 regardless of game version and updates. Easiest way to determine if the game is updated is to try out if the fixed bugs are still present, most notably unable to use Alt+f4 (fixed in patch 1.01) and if pressing Up+Left/Right with keyboard/d-pad results character to stop all movement instead of moving into Left/Right (fixed in patch 1.02). Some digital versions are still at version 1.00 and official patch can only be applied with retail version of the game. If you own this kind of version of the game, PCGamingWiki download includes prepatched game executable for these versions of the game. Some versions of the game include autoupdater in <path-to-game>\gu.exe, while with others the executable is replaced with copy of main game executable. For users of the Steam version of the game, you can easily check which version is installed. Go to the Steam installation folder, then \steamapps\common\ValveTestApp207490\Readme\(Language). The readme.txt file will say at the top what version has been installed. FMV cutscenes and map screen are Vert-. Frame rate is capped at 60 FPS. See Run the game at screen refresh rate. Mouse can't be used outside menus. XInput and DirectInput. See Controller support. Only if controller is plugged in with initial game launch, see Controller support. Prompts are labeled X-Y, X being player number and Y button. Prompts are presented as text instead of icons. With first launch, game automatically assigns initial button bindings. If no controllers are connected, first player is bound to keyboard. If XInput controllers are connected, they are automatically bound to player numbers starting from first. After this, controls have to be bound manually to each player. DirectInput controllers do not have automatic bindings at all and always need to be bound manually. If some controller has non-centered axis (DualShock 4, steering wheel, joystick, throttle, etc. ), game will pick it up constantly making rebinding near impossible for all players. To bypass these issues, use XInput wrapper and unplug unused controllers. It's possible to trigger autobinding again in future simply pressing Defaults: RESET from settings. However this overwrites all the manual bindings done. Speech is mumbling and always subtitled. Multiple reports indicate that save games can be corrupted. Usually game creates file called SavegameCSavegame_X at the parent folder of save game data path. Manually copying file into save game data location and renaming to Savegame_X (replacing X with save slot number 0, 1 or 2) should save the save game data and allow progressing in the game. Multiple reports indicate a problem with the Ticklish Temples level Tricky Treasure, where the character appears zoomed in, that the environment cannot be seen properly. The bug exists also in "Playing in the Shade" level during using non-panoramic monitor. To get rid of it, just set panoramic resolution (1280x720 or 1600x900) and continue. The zoom glitch will no longer occur. Multiple users report that there is stuttering or frame rate problems on systems which greatly exceed the minimum specifications. Any mouse movement will instantly freeze the game until the cursor stops moving. Alternative try changing keyboard delay settings in control panel. Reportedly there are problems with using diagonal controls, including keyboard diagonal movement and D-pad controls. The best way to resolve this would be to use the analogue stick on a controller for movement. Should be fixed with patch 1.02. PC version's video files are much more compressed compared to console counterparts. Download and unzip the video files. Optionally backup old *.bik files. Replace the files in the folder with downloaded ones. Converted 60 FPS PS3 videos included in the package. Install Special K by following the Special K Unofficial Guide. Manual local installation is recommended. Open <path-to-game>\d3d9.ini or %USERPROFILE%\Documents\My Mods\SpecialK\Profiles\Rayman Origins.exe\SpecialK.ini depending on the injection method you used. Bink Video Very low quality, 30 FPS videos included. See the fix Pixelated Or Low Resolution Cutscene Video. ↑ 1.0 1.1 File/folder structure within this directory reflects the path(s) listed for Windows and/or Steam game data (use Wine regedit to access Windows registry paths). Games with Steam Cloud support may store data in ~/.steam/steam/userdata/<user-id>/207490/ in addition to or instead of this directory. The app ID (207490) may differ in some cases. Treat backslashes as forward slashes. See the glossary page for details. 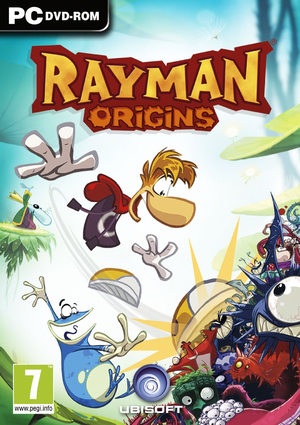 ↑ Rayman Origins Pixeley Zoomed In Glitch - Steam Users' Forums (retrieved).